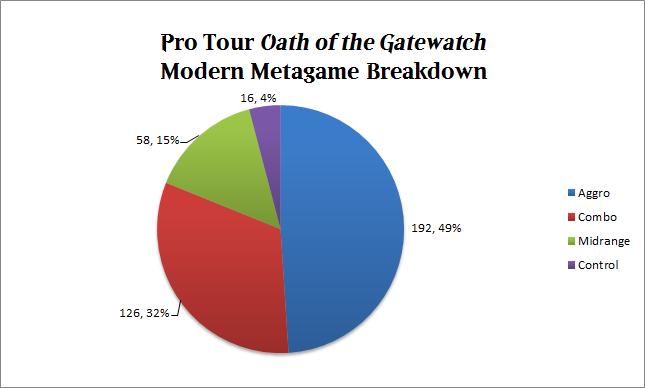 Pro Tour Oath of the Gatewatch reintroduces a revitalized Modern format. Modern has undergone some huge changes with the banning of Summer Bloom and Splinter Twin. There's huge opportunity for innovation with the format's two most popular combo strategies out of the mix. Let's see what decks the best players in the world brought to battle with on the game's biggest stage! 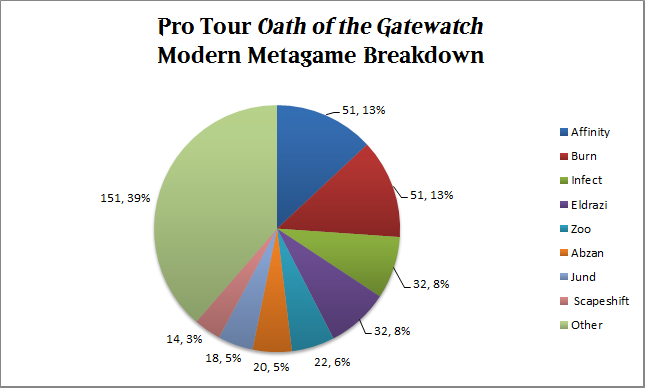 If we count Burn and Eldrazi as aggro decks, then the aggressively bent strategies account for nearly half of the Modern metagame here at Pro Tour Oath of the Gatewatch. Combo strategies in a wide variety of forms account for about a third of the field. Once dominant midrange and control decks have encountered difficulty in pinpointing what their opponents would look like and have, expectedly, showed up in much smaller numbers than they might have at previous Modern Pro Tours. Affinity and Burn were the most played decks by a very wide margin, with 51 players apiece. Affinity aims to empty a hand of under-costed artifacts as quickly as possible to overwhelm the opponent and often win as early as the third turn. It's no surprise that Affinity was a favorite among the game's best players. Affinity has the ability to get underneath control decks with powerful late games or race opposing combo strategies. Affinity's biggest weakness comes in the second and third games, where opponents can bring in cards like Stony Silence and Ancient Grudge to drastically sway the match-up in their favor. Burn is similarly positioned to Affinity. The deck aims to apply huge pressure on the opponent's life total with inexpensive creatures before finishing off the opponent with burn spells. The deck is fast, but it still struggles to race some of the format's more focused combo strategies. The decks best strength is a consistency that allows the burn player to enact a similar game plan for victory in every game. No other decks account for ten percent of the metagame. Infect and Eldrazi strategies come close, though, with 32 players apiece. Infect is the combo strategy of choice this weekend. Playing a slew of Infect creatures allows the deck to use pump spells with double efficiency. The deck dares opponents to tap their mana so that it can unload and win the game as early as the second turn. Eldrazi is Modern's latest hit. The deck uses Eldrazi Temple and Eye of Ugin to drastically reduce the cost of powerful Eldrazi spells like Thought-Knot Seer. The sheer size of the deck's threats and the speed at which they come down makes the deck one of the most impressive aggressive strategies in the new Modern. Zoo decks are remarkably popular with 22 copies in the room. Zoo is a classic strategy that aims to combine some of the most efficiently costed creatures with Path to Exile and Lightning Bolt, the format's best 1 mana removal spells. 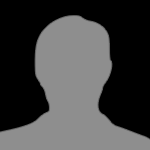 Jund and Abzan usually have a big presence at Modern events, especially at the Pro Tour level. This weekend, Jund and Abzan players are in short supply; perhaps they fear Eldrazi and Tron strategies that seemed likely to show up in big numbers after the recent format's shake-up. From there, we find a slew of combo decks that make sideboard choices a nightmare this weekend for control players. Scapeshift seems to be the most popular, but Ad Nauseam and various Goryo's Vengeance decks also litter the room. Here's the full metagame breakdown! Modern is a wide-open format and no single archetype accounts for even 15% of the metagame this weekend. This weekend will likely determine the future direction of the format. Stay tuned to all the action as it unfolds here at Pro Tour Oath of the Gatewatch!